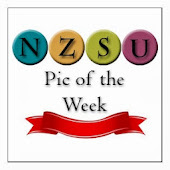 Well it's week two of the Stampin Up Demonstrator interviews and this week I contacted one of our lovely ladies in the South Island, Lisa Bullock from Canterbury! 3. 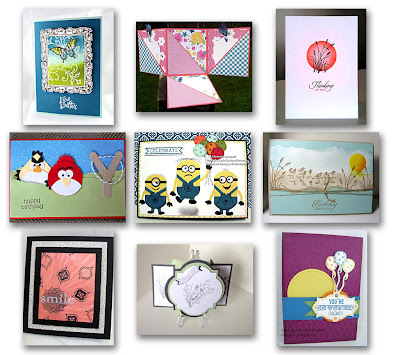 What makes Stampin Up product different from others? Great quality stamps, you don't appreciate them fully until you use a non SU stamp and see the difference. I love the colour coordination of the products too, Cardstock, inkpads, markers plus ribbon, buttons and all the other lovelies. 4. 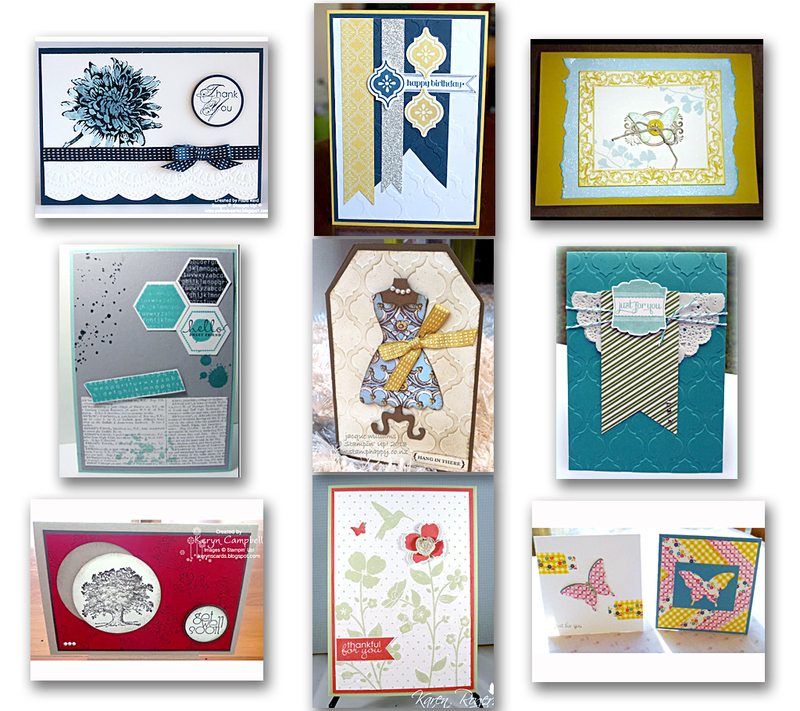 What is your Favourite, wouldn't be without Stampin Up Product new or past? 5. What was your favourite class and why? My favourite classes are kids ones. You can guarantee that even when you give the children all the same supplies that not one of them will come out with a card the same as yours. They don't seem to have the same need to follow the "rules" as adults do when creating. 6. If you got asked to take 7 things along to a blind demonstration what would you take and why? Whisper White A5 folded into Cardbases (back to basics, you can show lots of different ways to do one layer cards), Coordinating ink pads, Post it notes (for sponging or creating a frame), Stampin' Sponges (lots of fun effects there), A stamp set like the new Wetlands one because it has useful sentiments and images, Stazon ink pad (waterproof!! great for line images and sentiments ), Aquapainter (another way to colour line images). These are all good basic products which you can do lots with. 7. 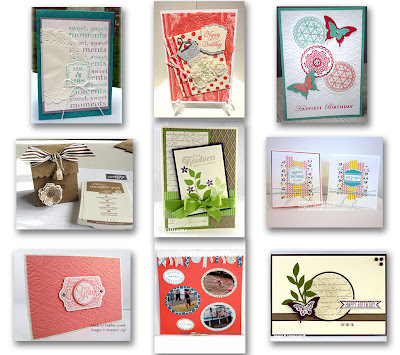 What is your best Stampin Up tip? Play! Experiment, think outside the box. Not only will you become really familiar with your product but you will discover lots of different ways to use it and be able to share that with your friends and customers. People love to get more bang for their buck so show them how to get the most from their products. 8. What is your favourite technique? I'm not big on Techniques but I do like to learn new ones. The last one was Whitewash Effect where you use slightly watered down Whisper White Craft ink to "white wash" colour onto a White embossed line image. Allow to dry thoroughly then use watercolour pencils or markers to colour it in. I do love sponged effects too. 9. Lastly what was your funniest Stampin Up moment you can remember. Middle Row L-R: Jenny Humphreys, Sally Stuart, Sally Williams. Seeing today is the official launch of the new 2013-2014 Annual Stampin' Up! Catalogue, I thought I'd take this time to interview a few of our fantastic Demonstrators. It's always nice to get to know our team. 1. 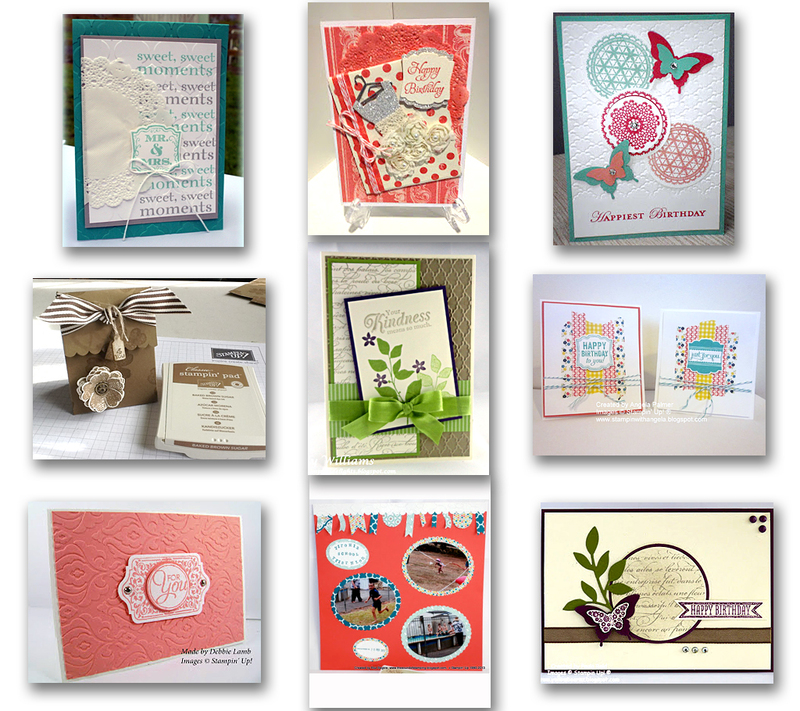 How long have you been aware of the Stampin Up products? 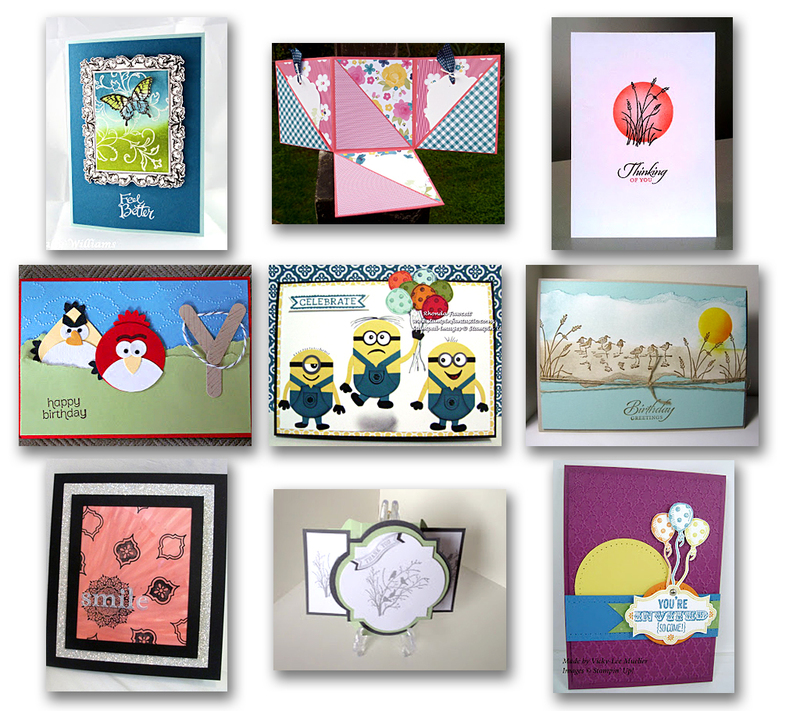 2. Who introduced you to Stampin Up. "I went to a workshop that Jacque Williams did for Julia Leece before she signed up"
3. 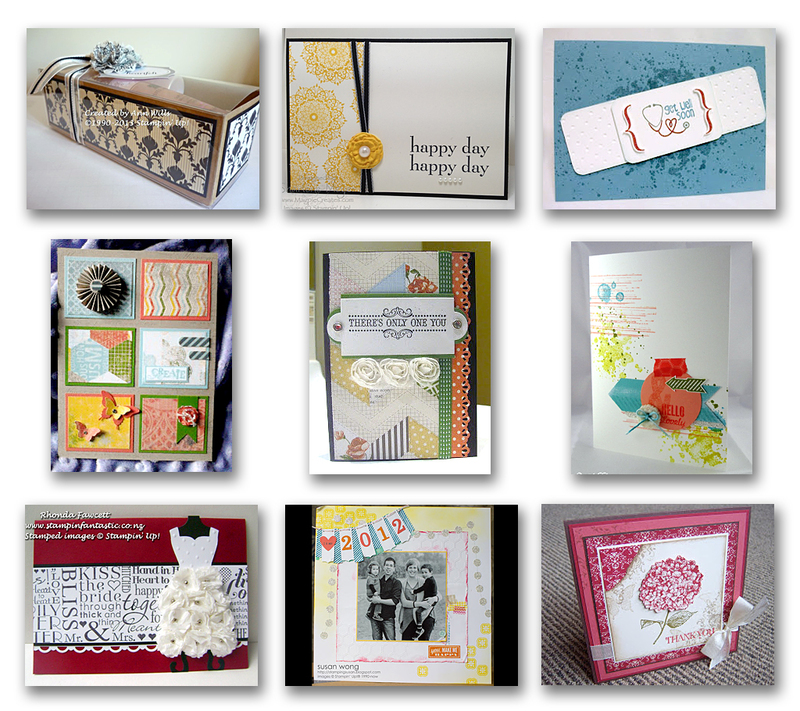 When did you become a Stampin Up Demonstrator. 4. What made you decide to be a demonstrator? "I wanted EVERYTHING in the catalogue so I thought I had better sign up so I could at least get a discount"
5. 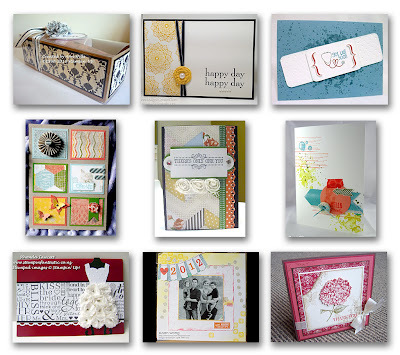 If you had 5 minutes to collect as many Stampin Up supplies for a rush event to help support another demonstrator, what would you collect and why? "Big Shot, handbag die, & an embossing folder. Card Stock - Whisper White & a couple of coordinating colours. Matching ink pads or markers; Wheel with Versa Mark cartridge. Embossing Powder & Heat Gun. 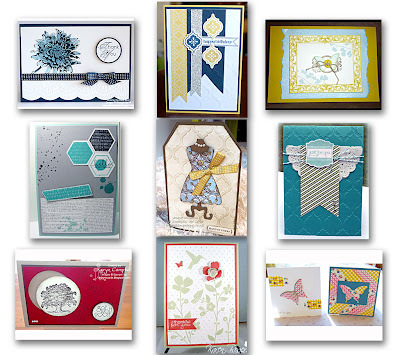 Stamp Set, Paper Trimmer, adhesives, Dazzling Diamonds"
simple card using the other products"
6. 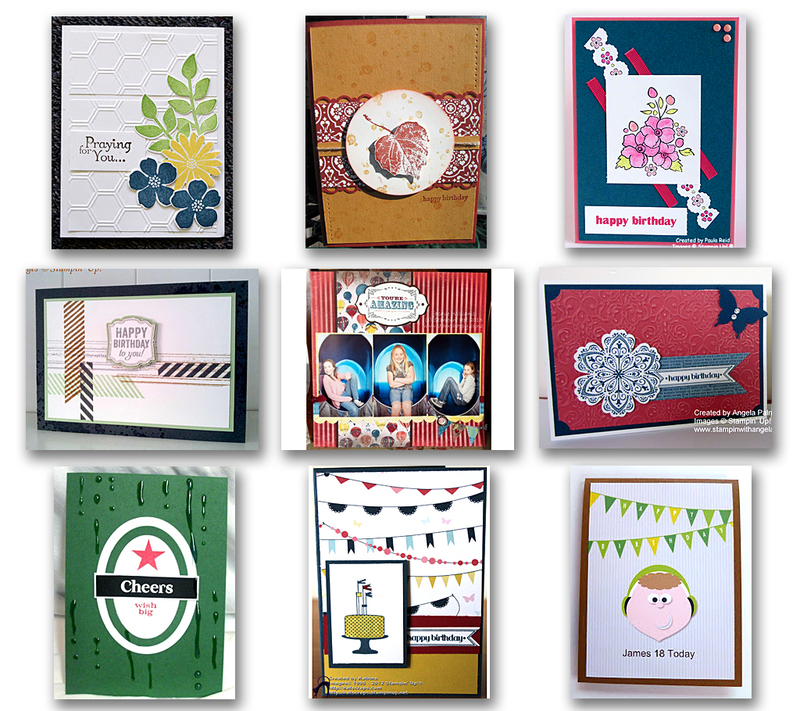 What current Stampin Up tool or stamp set would you never live without? "Big Shot & I suspect the magnetic platform when I get it"
7. 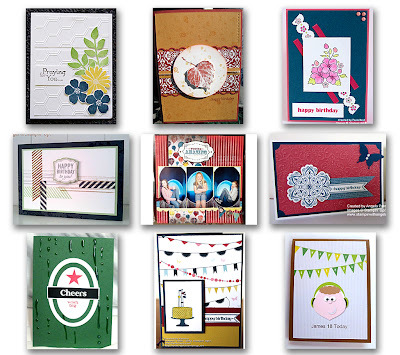 What is the best Stampin Up tip you have. what sells, hence the reason I always demo the BS & heat embossing"
8. What is your favourite technique. when you go from Whisper White Craft to the other colour"
9. Lastly, tell us what your favourite class was and why? If you'd like to know more about Ann and her business please visit her sites below. She is available on both DBWS and her very own blog, which is linked to NZSU. Middle Row L-R: Paula Dobson, Jacquelyn Williams, Angela Palmer.